Global Express (7:20am, Your Morning Brew) Ana Tihoux, La Bala The Chilean hip-hop artist collaborated with Oscar-winning Uruguayan composer Jorge Drexler to fill out the sound on her follow up to the break-through album 1977. 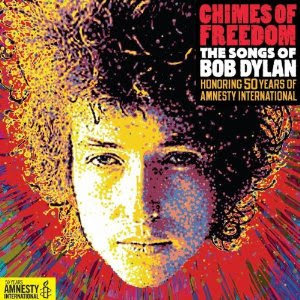 Featured Album of the Week (8:20am, Your Morning Brew) AND National Pick of the Week (5pm, The Home Stretch) Various artists, Chimes Of Freedom: The Songs Of Bob Dylan There are so many great songs on this 4-CD set that we made it a featured album on both shows! Sales of the disc benefit Amnesty International. Local Pick of the Week (3:30pm, The Home Stretch) Various artists, Tucson Songs: Exciting New Sounds From Southern Arizona The rest of the world discovers what we already know - Tucson is home to an amazing array of great musicians. This disc is a recently released European compilation. Classic Cuts of the Week (4pm, The Home Stretch) Al Green, Let's Stay Together We debut this new feature on The Home Stretch - along with our new host, Jennie G! - with an album that turns 40 years old this week. Let's Stay Together spent 10 weeks at #1 on the R&B charts.